They cut down our trees, so I made popsicles. It’s a long story, but let me just say that our house went from being a cabin in the woods to a camp at Burning Man in a matter of hours. Seriously, I feel like I’m living in a microwave over here. Popsicles to the rescue! For me, Bellinis were the obvious choice – delicate white peaches paired with cold, crisp prosecco. 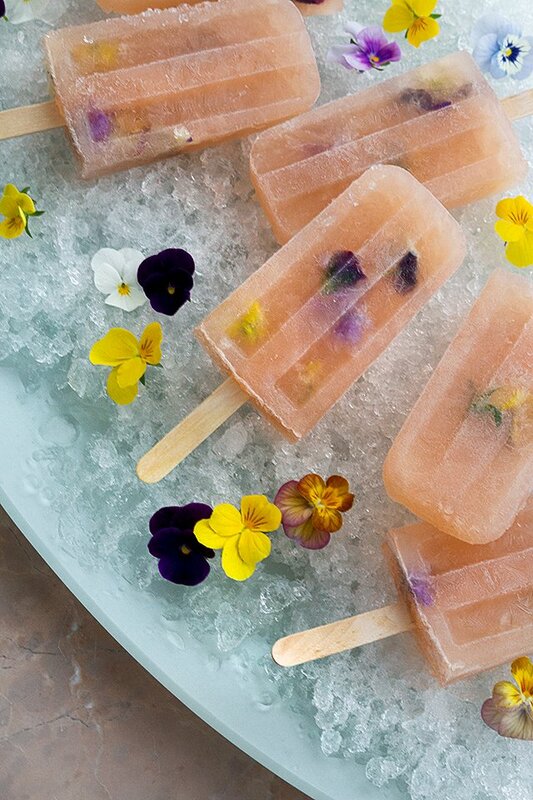 Add a few edible violets from the garden and these popsicles are simply perfect for entertaining. Now if I only had a reason to celebrate. Until then, more for me! 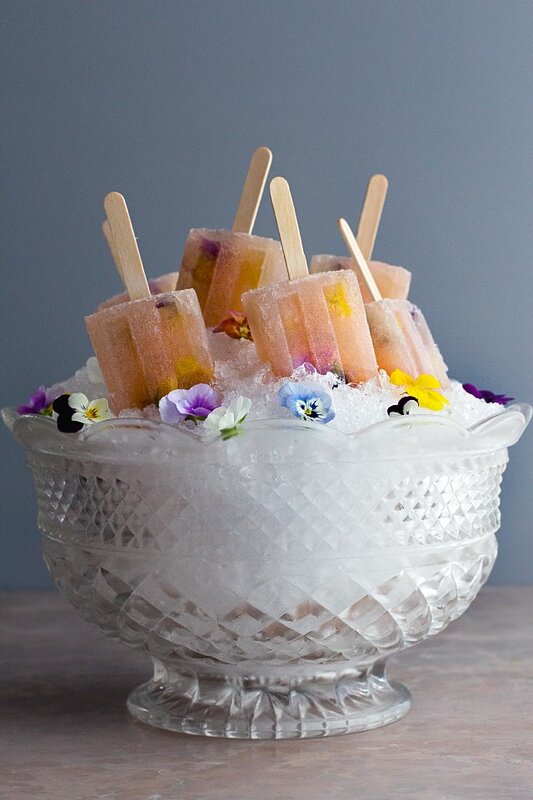 A bellini in popsicle form, made with prosecco and fresh peach puree, and decorated with delicate edible flowers. 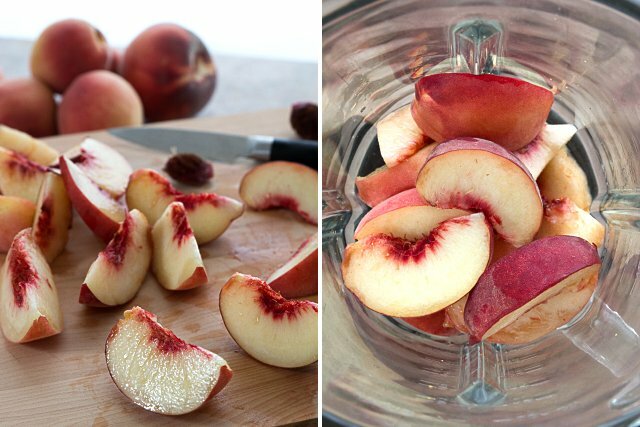 Chop the peaches, removing the pits, and add them to your blender. Puree until smooth and strain through a fine mesh strainer. 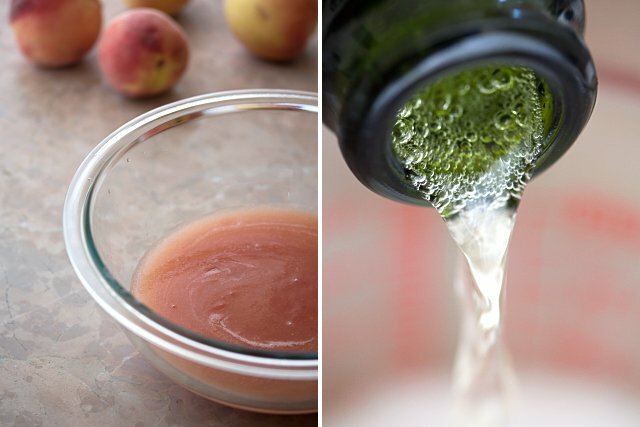 Transfer 5 oz of peach puree to a mixing bowl. Add the lemon juice, prosecco, simple syrup, and bitters. Carefully add the prosecco, as it will foam aggressively. Stir to combine. 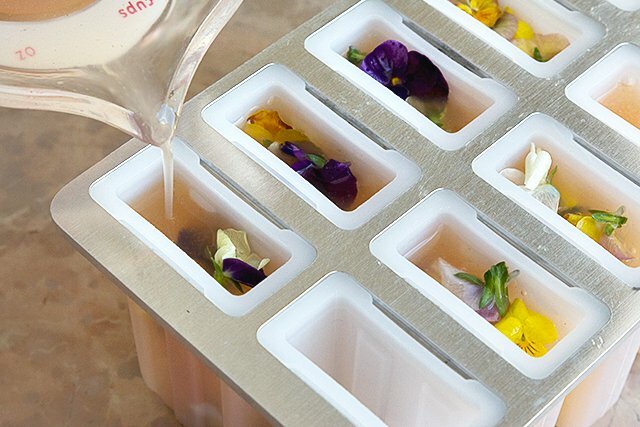 Wash and dry the edible flowers and add them to the popsicle molds. I used violets. Pour the peach mixture into the popsicle molds. The flowers will float to the surface. 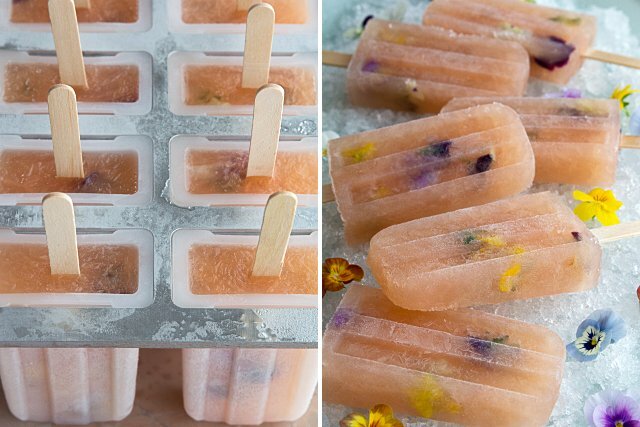 Place the popsicle molds into the freezer for approximately 30 minutes or until partially frozen. 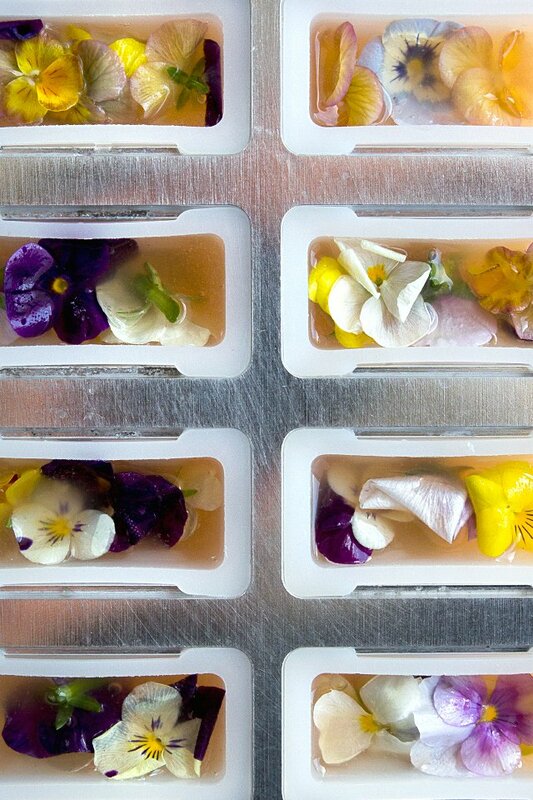 At this point you can gently mix the popsicle to evenly distribute the flowers. This is a good time to add the popsicle sticks too. Place back into the freezer until frozen solid. Once frozen, release the popsicles by running them under warm water for a few seconds. I loved your recipe! Thank you very much, they are so beautiful. Would it be okay if I translate your recipe into danish, took some of your pictures and shared it on my website with a link to your page. Very pretty! Where did you get your mold? I’d love to find one like that! These are so fun for a summer party! I love you took pictures with each step. It makes it much easier to follow along and recreate. I will definitely remember this for this summer! Hey Todd, in Aus we don’t have readily available bitters. Just good ol’ Angostura… can you leave that out or replace with Angostura? Ta!! Hey Char! You’re getting a totally different flavor profile with the Angostura bitters, so I’d probably just leave them out. Good question! Wow, these are really pretty. I love that last photo. I’m thinking would add a little elderflower liqueur. These are super pretty!! Would be great for a bridesmaid party! Thanks for sharing! That would be perfect!! Thanks Dee. You are TOO nice Tamara!! Happy that you like them. Hopefully ou’ll give them a try. 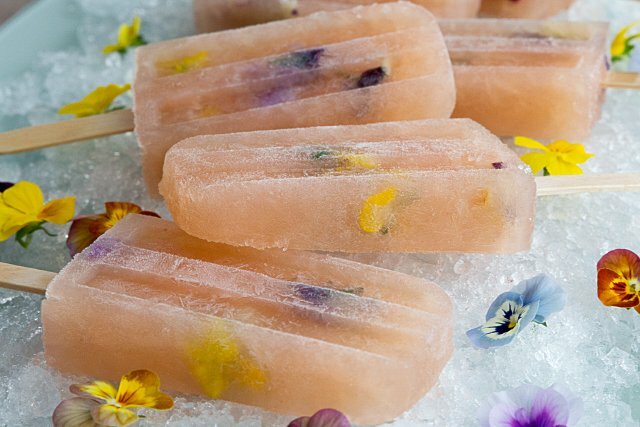 These popsicles are absolutely beautiful! And I bet they taste lovely too. Love, love, LOVE these! What a gorgeous presentation and flavor combination. It’s boiling here in Denver- I could go for one of these right now. Even at 11:30 at night. YUM. 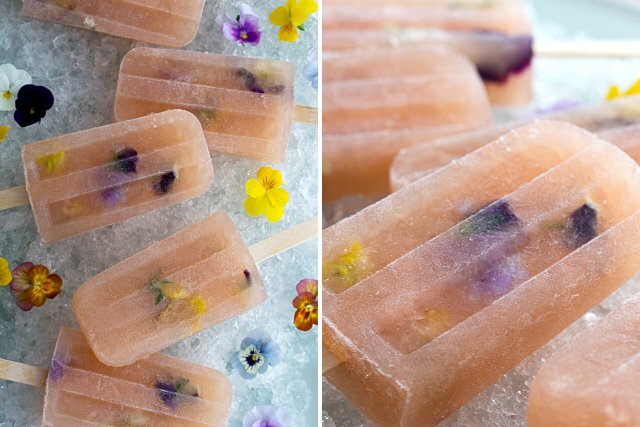 Edible flowers in popsicles? How beautiful! I just had one of these bad boys…. frozen champagne goodness and amazing! Wow, thanks!! As long as you like prosecco and peaches, you’ll love the flavor. Tiny little edible roses would work great! Prrroobably the most beautiful freaking popsicles I’ve ever seen. Wow, thanks Ruthy. Them’s big words! Seriously your BEST post to date!!!! I’m soooo making these. Thank you Leslie!! That’s so nice of you to say. Let me know how they turn out if you make them. Your trees!! That is a tragedy! 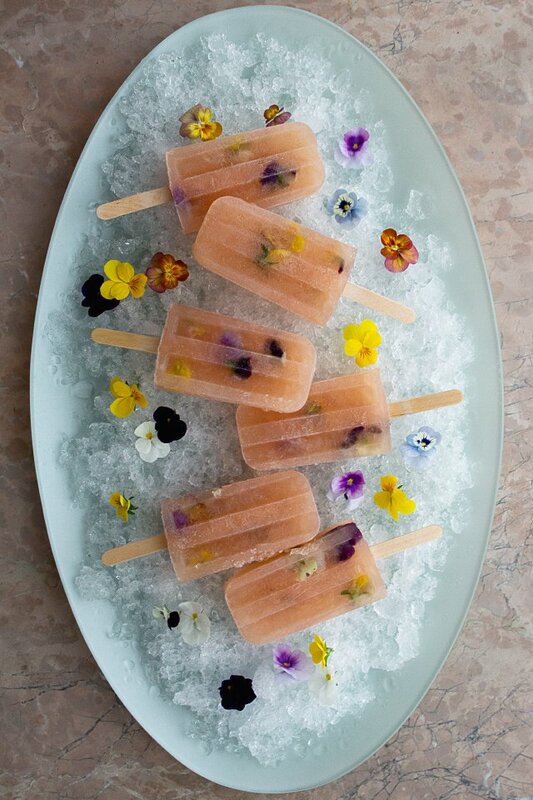 These Popsicles look wonderful, I can’t resist edible flowers. I know Sarah…a tragedy indeed! I feel like I’m sitting on time of an overhead projector. Do they still make those? Thanks for the popsicle love! Way to handle a quasi-crisis! These look wonderful with a capital W and Todd, you have talent with a capital T. Very beautiful and equally impressive. Great post!! Thanks so much Dan – means a lot. I’m officially out of pops so I’m starting to freak out. It keeps getting hotter!! Todd these are GORGEOUS! Pinned! I recently got this cookbook about edible flowers and it’s just been such an eyeopener and so great to see all the ways to use (eat) flowers! Thanks Averie. I’m just starting to experiment with them myself. I’ve always only had them in salads, but they make things so pretty, I gotta keep trying new things. These popsicles are so pretty! Love it! These look SO gorgeous – YUM! Thank you so much Amy!! These are show-stoppers! Perfect party fare. These pops got it goin on… Such beautiful photos!! Peaches and prosecco AND edible flowers? Um, 10 for me, please! This is my perfect pop, Todd! Beautiful photos, as well. Btw, I really hope your hand is feeling better. 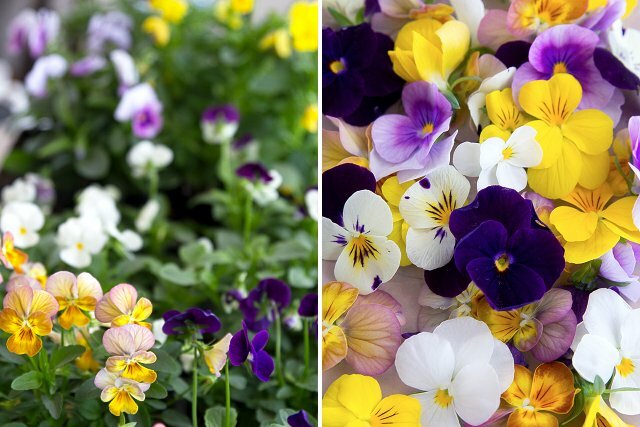 Must find me some edible flowers ASAP! These pops are just stunning! 25 Ways to Make Your Kitchen Bloom: All the Edible Flower Recipes | Everyfoodrecipes, cooking tips, and how-to food videos—all rated and reviewed by millions of home cooks,make the perfect birthday cake, or plan your next holiday dinner.